When I Stray, He Bends GIVE AWAY DAY! If you are joining me here today from Proverbs 31’s Encouragement for Today welcome! I’m so glad you’ve stopped by! Yesterday was a hard day for me; I’m sure you’ve had one of those. I so needed to sense God lifting me and bending to me. My heart was so set for a change in the tide; for something good to happen in the life of my child..and it didn’t. My heart swirled as I tried to bring comfort to those around me, yet my heart needed comforting too. I wanted to turn to something tangible. Chocolate? Submerse myself in a novel or tv show? It was all I could do to once again turn to prayer. Romans 8:26 says when we don’t know how we ought to pray, the Holy Spirit comes in and partners with us. I’m so glad He did. As I just started to be honest with Him about how I felt; the worry and fear that were trying to take over in my heart. Then I began to praise Him for what He was doing that I could not see and my spirit began to lift just a bit. Praise empowered me to care for the rest of my family while my heart processed my disappointment. Friend – life is hard, there is no doubt about it. Sometimes when we are processing that “hard” we’ll do great and win. Sometimes we won’t. Of course, it is God’s desire for us to win every time, but just remember, on the days we fail, He stoops to pick us up again. 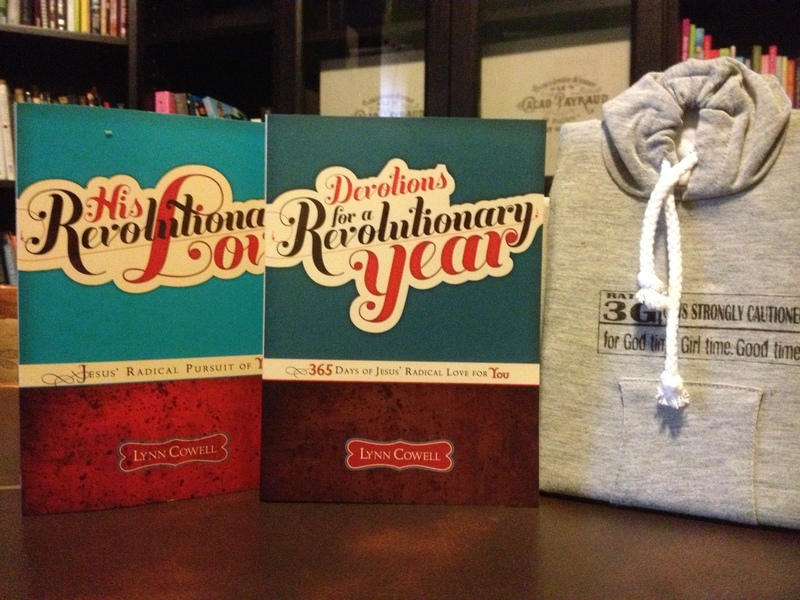 Today, I am giving away a Faith Builder Pack – signed copies of my books “His Revolutionary Love” & “Devotions for a Revolutionary Year” as well as a sweatshirt journal. These resources will help build the faith and foundation for the teen girl in your life and speak to the heart of women of all ages as well! To enter in the drawing, just share in the comments below or at www.LynnCowell.com a time you felt God stoop to you. If you’re busy, just comment “I’m in!”. Let’s praise God for the times He has reached down to lift us up! I knew God stooped and lifted me when my husband was sick. Nancy, I received His mercy and care during illness as well, when my father died of cancer. Thanks for sharing! I am in! I have been searching for a daily devotion for my 13 year old daughter and God answered my prayers today and led me to you. I can’t help but to have fear and worry in my heart for my daughter. I pray that God will stoop in and lift her up during this difficult time. She suffers from low self-esteem and is carrying a load of guilt. You see, she made a mistake and is being punished for it, but the guilt she is carrying is becoming a heavy load for her. I am trying to encourage her to ask for forgiveness and to forgive herself, but she is having a difficult time with it. I know that God will see her through it. Please pray for me and my daughter. I am praying everyday that God will continue to give me the encouraging words she needs to hear and that His love for her will be revealed to her. Thank you so much for your encouraging words and bringing mothers of teenager daughters HOPE!! I work as a counselor in a public school. However, I have the privilage of being an advisor for our Fellowship of Christians club which meets regularly before and after school throughout the year. Because of this, many parents know I am a Christian. A parent I met with last week was very concerned about the health of her daughter. Her daughter was undergoing various medical tests to determine why she had not been feeling well. The parent asked me to pray for her daughter. She told me she had all her prayer warriors lined up and praying for good results. I just spoke to the child this morning and our prayers were answered. She was given a clean bill of health! This truly lifted my spirits this morning! My mom is returning to chemo after a 6 week chemo-free “holiday” so it was just the news I needed…our prayers were heard! Kim, that is so wonderful! It is these “good news days” that help us to remember the faithful of God on the “bad news days”. Thank you! God not only stooped, but carried me when our third child, a newborn daughter, died. Without His grace I would never have made it through the darkness of grief and guilt I felt, nor would we have gone on to have three more wonderful blessings. He truly redeems the years the locusts have eaten! This morning I felt my anger start to surface as I dealt with three wide-awake children 4 and under at 4am, then was brought to my knees soon after as I learned that a friend had lost her baby last night. God most definitely stooped to my level as he humbled me with His grace. One morning I couldn’t sleep and the worry kept overwhelming me. I felt so scared and alone! The phone rang and it was a women from a prayer line I had called several weeks before after watching a random Christian telecast. She just wanted to check up on me and my family and see if we were alright. I couldn’t believe it. I had never seen that Christian telecast before and I just stopped to watch it as I flipped through channels. Most of the time you never hear anything or even ANYONE real in return when you call a prayer line, and here she was calling me back. I felt that was God talking to me through her, telling me I am not really alone and that I shouldn’t give up. That call meant so much to me! It really lifted me up. I knew God spoke to me many times in my Life. I have battled cancer and Won. I lost my Husband in Afghanistan fighting for our Freedom. God Said, Be sad but know I have your back. God Bless America and God Bless Us All. God Bless you and your family for service and sacrifice. We’ve been through two deployments (Iraq and Afghanistan) and those were the hardest months I’ve ever dealt with. Pregnant the first time, 3 kids the second. Everyone was amazed how strong I was…I give it all to God. May God bless you both and your families!! Thank you VERY MUCH for your sacrifice! I am learning to live in full surrender to my Lord Jesus Christ. He is calling me to such a sweet place in Him. The enemy is battling hard to retain control of my mind through wrong thinking; I have believed hislies and he has stolen too many years of my life.lowed him to steal so many years of my lifThe Lord is showing me how to do battle against the principalities of darkness, to take those thoughts captive and replace them with His truths. I am discouraged so much in pursuing an open communication relationship with my tween daughter. She is just so defensive and pushes me away no matter what kind of conversation I try to initiate. I felt God bend down and lift my heart last night. She wanted me to teach her the science chapter that she was on and help her study for the test. I was shocked because she never wants me to get involved. We spent hours on it. Not only did she have a great attitude the whole time, we had fun doing it. I even got sweet hugs and several “I love you, Mommy.” Truly a kiss from God as he encouraged my heart. * always give her your 100% attention when she talks – eye contact, no phone, etc. These are a few things I have learned with my three teens. Hope they help! Feeling alone last night then I come into work and read this. My mom has lung cancer and I travel 1 1/2 hr to her house to help with doctors appt & chemo, grocery shopping. etc. When I not there a young woman comes by to help with the little bitty things mom cant do because of the pain in her legs. My Dad is a stroke patientl that can take care of himself to a point, but needs help on some things. I am very thankful for this young women, but everything is about her at this point. at times I wanted to give up on helping take care of my parents, but I know that is not God’s will. It has put on hold on my life and I get selfish sometimes that I want more for my life, my dreams and so on. but I know that it is not my time. tha I t will continue to be his hands and feet. It’s so nice to read your devotion today. So often when I fall short; I feel unworthy of forgivness AGAIN. It’s like a roller coaster… when we go up; life has thrown us a challenge, then we go down and we are relieved its over. But then we get right back in line to ride again…? Strange right? The Lord leads me out of the waiting line of sin and gently brings me back to him, he is so faithful to us. I ask him to forgive me once again. Too many times to count He has stooped down to me. Loving me, correcting me, humbling me. But always gently. I praise Him for his great mercy and faithfulness in my life!! He stooped to me yesterday when I was so distraught and angry that I didn’t know what to do. I still don’t know what to do but I have a focus and a calmn that He is in control and I am ready to follow His loving lead. Thank you dear Heavenly Father for your constant forgiveness. Please help me to live a life that is pleasing to you! Thanks for sharing the tools for listening, which God uses to provide His healing! I enjoy and need the encouragement of other Christian women. Society tricks us to set the bar SO high for ourselves and of course we fall flat on our faces. How reassuring to be reminded of Gods love, ever presence and forgiveness. We need to just simply turn to Him and ask. Complete surrender! I learned about this last year when I was sick and out of commission for about 6 months. With 3 young children, husband, job, school and church commitments, I didn’t “have time” for this. BUT, the Lord opened my eyes to what was important to Him. The Lord continually stooped down to me. I grew in faith through my experience and pray God uses me to be a light to those around me, so He can be glorified. Thank you Lynn for your encouragement! I love your blog! I realize it is mainly geareed towards women who are raising young daughters, but I wanted to share this. I will never forget the day when my 25 year old son came to me and spoke the words to me that literally caused the bottom to drop out of my life. He told me he didn’t want his life to continue. He said he had not been happy for a long time and that just didn’t want to go on. With that, he turned and walked out of the room. I lost all ability to speak, think, move or hear annything but those words screaming in my ears. I immediately began praying. Little by little my normal bodily functions began returning. I have been praying ever since. When I was able to go talk to him, he informed me that he didn’t believe there was a God. I couldn’t believe what I was hearing and was in a total state of shock. To make a long story short, it was prayer and my unshakable faith in God that got me through this. I am happy to say that he is doing much better and his faith his returning. I cannot explain the tremendous joy that flows from my heart when I read a post on his facebook that accredits God for blessing him with this or that. I know he still has a long way to go but, these baby steps are such a blessing to me and I know that through my diligent prayers and Gods amazing grace, he will be ok now. Oh, Marsha! I too have learned to hold on to the baby steps. It helps make the ones backwards a little less painful! I cannot imagine the hurt in your heart when your son told you these words. How painful! Don’t these baby steps get us through when we experience big steps backward? Thanks so much for sharing! My husband didn’t have a steady job for almost 3 years! Then early last year he got an amazing job, truly a dream come true. He was able to travel, we got caught up on our bills and could breathe again. Last month, right before Christmas, he was laid off along with 500 others. It was shocking news, and I just got a third of my salary cut, but we feel like its going to be okay, God is giving us grace, He is bending down to us, letting us know that He will take are of us. We are grateful that my husband had such a great opportunity and experience and know that another one is yet to come! Love that Masako…another one is yet to come! He is faithful! I’ve seen and felt God carry my hubby and I thru this past year after a devastating loss of sorts, but we have come to see that it wasn’t a “loss” but a “wait for the right time and place”! But there has been soooo many times God has, as an old song by Twila Paris states (this will show my age!! =) ) “They don’t know who picks me up when no one is around! He’s sent a “love note” to me, whether it was money from an unnamed person during a bout of unemployment or a simple flower defying the odds to grow and blooms where it is … and SO many other ways He has reminded me He has not forgotten me! Thank you Lynn for your writings today in “Encouragement for Today” and above. Blessings to you as you too follow God’s leading! And to everyone who’s posted — it’s so encouraging to read how God’s touched others too! Love that song, Su! Listened to it over and over again as a young woman trying to follow God’s will when my heart wanted to follow a boy! I felt God gently telling me what I thought was the desire of my heart was not according to his will. I need to look to Him to fulfill my needs. Camille, I am so glad you did! Your fear, that she will look for love in all the wrong places, is exactly why I wrote “His Revolutionary Love”. In “His Revolutionary Love” I help young women see that no man, be it a dad, boyfriend or husband one day, can ever fill the love gap in their hearts. Only Perfect, Unconditional love can. You might want to get the book. If she is too young to read it, you can still begin, now, while her heart is so soft, to fill it with the truth that Jesus is crazy about her and that is the Love she needs! When He led me here! I struggle with the negative behavior and disrespectful attitude of my tween daughter and so often just feel like giving up and frequently respond to her in a much less than Christ-like way. I’m so thankful for God’s grace and mercy everyday and that He doesn’t give up on me and won’t let me give up on her! Joyce, this time is tough, but keep sowing seeds of patience and love because you are building the foundation for your relationship in the teen years. Consider going through a Bible study like “His Revolutionary Love” or reading “Devotions for a Revolutionary Year” together each day. When you have something positive going into your hearts together, it really brings a beautiful dynamic to your relationship! God stoops down and lifts me up several times each and every day. I thank God for His patience, His mercy and His compassions which NEVER fail. Without Him I would be so lost. I have a teenage daughter and a tween daughter. I pray so desperately to be able to share God’s word with them but often feel inadequate. Thank you for your helpful website. Hang in there, Devona! 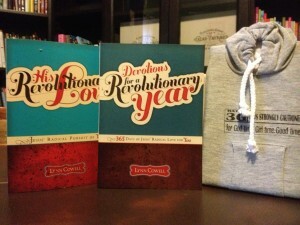 Maybe you could try reading “Devotions for a Revolutionary Year” to your girls each day! That is what I do to get God’s wrod into their hearts. As they fill their stomachs at breakfast, I fill their hearts with God’s word! I signed up for the Proverbs 31 devotions after my friend Amy sent me the one on how to pray for those families at Sandy Hook Elementary. I have made it through the Daily Audio Bible once so far and headed back in for another year of hearing the Word of God every day of the year- this year I am adding this Proverbs 31 ministry to my daily bread. Today’s article hit me where it hurt and prompted me to ask for forgiveness from a friend. My transgression has been eating at me for a month now and your wise words gave me the courage to ask her forgiveness- I know her grace will cover it and she will not remember it as we move forward. I am so blessed to know that before I even bring it up with her, but I too believe that asking for her forgiveness will help teach me to guard my words with wisdom as I move forward. Thank you for your ministry- daily devotions speak to each of us differently and today’s was the prompt I needed to grow in wisdom and strength and stop covering my transgressions with my own excuses. So glad, Kelly! God’s timing is perfect. How wonderful you used this prompt as the catalyst to obey! Wow, April! So awesome He bent and you obeyed! Thank you so much for sharing it with others, Kimberly! some results but the world has a strong pull to kids in regular schools. I am very encouraged when I read my daily Proverbs 31 devotions … then to read all the great comments from everyone, it is so encouraging and renews my faith. Our family continues to struggle financially …. between my husband and I, we have experienced 3 job layoffs in the past 4 years. We have been faithful to God as we experienced him pull us through these tough times. However, we really need to have a stronger faith as he pulls us out of the “financial” sink hole we are still facing …. down to our last $$s – trying to afford gas for my hubby to get to his job and struggling to keep our utilities on and just stay afloat, we are feeling hopeless and in despair. We are praying for God to lead us to the correct path we are to take …..
Love your encouraging word…. thank you for your reminder of Gods love and forgiveness!! Thank you so much for sharing! Can I pray for you? My 17 year old daughter is having a bad day today, and nothing I say seems to help. Then I just opened my email to your devotion. I’m hoping that your book will help her get through days like today, and encourage her to seek God during these times. Thank you! He came and held me when I was dealing with some pretty broken relationships. I am having one of those …… God, lift me and bend me now moments. God lifted us up after my husband was in a car accident that totalled out truck. Not only did he bless us by saving my husband and helped him with a speedy recovery but he provided a speedy claim process with the insurance that made it possible for our family to get another vehicle ASAP. No matter how bleak things look at times and how impossible some situations seem God ALWAYS is there. My daughter is not a teen yet but we have been dealing with a bully situation for quite some time. We pray every morning for good days and I always pray that she knows without a doubt she is more than what some bully tells her. Kids now are so mean. I pray she knows that God has a bright future planned for her bc she believes in Him! Is that the same book that there is going to be a drawing? If it is and I don’t win I will try to get it. I am so grateful that the Lord is always faithful… even when I am not. I could so relate to the desire to eat or read or run in some way when in pain. The true relief only comes when I face the pain with Him. I am thrilled to know about these books for my teenage daughter. I like to have age appropriate devotions for her to read to start each day! I am stuggling with a decision with staying with a church that my family is not growing in to try to bring about change, or just give up and find a place where we can all grow. I have been praying about this constantly and I am waiting for God’s direction. I know that with a teenage daughter, it is an important time in her life to have godly influences in her life, but I don’t want to teach her that it is ok to walk away from things without trying to make changes. I just really want to do what would make God happy, so I will keep praying! When i think of how much my children crave my attention–it reminds me of how much God craves for my attention/relationship as well- and how He will embrace and love me- if i just turn to him! There are so many times God has stooped to me: in my growing up when I was a rebellious child, in my marriage when I’ve felt alone, and now in my parenting as I’m trying to raise Godly girls. I’m thankful for each time and that He’s always there! Lynn, and I’m thankful for your ministry…it has been helping me become a purposeful mother to and for my children. I’m In and I’m so very thankful for you! I’m In and have a blessed day! God stoops down to me everyday in so many ways. But the most profound would be when my father, an alcoholic and for most of my life, estranged, was dying. I walked into his hospital room and melted with forgiveness to him. I’ll never forget that feeling. I’m in! God stooped down and picked me up just minutes ago when I read your devotional. I was having a REALLY bad day (bad couple of weeks, actually) and got trapped in the “snowball” effect of sin. I praise God for His forgiveness and for leading me to your devotional at just the perfect time I would be responsive to it! Thank you! I’m in! God stoops down for me everyday! I just signed up for your blog and 7 days faith today. I receive the Proverbs 31 emails daily and they are usually spot on for me. Praise the Lord!! Many blessings to you and your ministry, thank you for allowing me to be a part of it. I am so in! I have struggled for the past 5 years with my 13 year old daughter. My husband and I so wanted a baby but were unable to conceive. We adopted “Olivia” from China 12 years ago. I know that God gave her to us because we would be the best parents for her, but we have struggled with rebellion and strong will. Olivia is very unattached to me mostly because I am the disciplinary. However, the other night I was reading a story to my 9 yr old daugher, also adopted from China, and Liv asked what we were doing. Before I knew it, my 13 yr old daughters had crawled into bed with me, laid her head on my shoulder, listened to me read the book and fell asleep sucking her thumb. If I could have paused that moment in time I would do so over and over again. Thank you God for showing me that deep down she does love me…..
My children are out of the home and I’m now a grandmother. I have found that many of the same fears I had for my children try to torment me regarding my grandchildren. One in particular has my heart heavy today, and The Lord has lovingly and graciously reminded me that He is still my burden-bearer. I love how our God works! I love my daughter and I want to grow for her and with her in the Lord. Thank you for your ministry! God met me in a very personal way last week at Bible Study… So much so that I was shaking my head and disbelief, and my friend was commenting on how much she knew I could relate… He gave biblical reinforcement to what our family was going through… this was so needed and appreciated, as I was feeling like so much of my sorrow, irritation and bitterness was related only to “my feelings/emotions” then He showed me there is biblical truth to what is happening! Amazing! I had one of those evenings last night with my teen daughter. It is so hard to be a 13 year old girl in today’s society. Scripture was there with just the right prayer for me recite on her behalf. Thanks so much! Thank you Lynn for your ministry and encouragement!!! i’m in! please share with me. God has stooped to me more times then I could possibly count, but the one that stands out the most is when I had to tell my girls that I have cancer. I didn’t have the courage, the words or the composure to tell them. As the time came to tell them God gave me the composure, the right words and the strength I needed. 2 months after that, I lost my mom and again God provided. He gave me grace and peace during those struggles that I could not muster on my own. I can NOT tell you how many times in my life that I have felt God stoop down to me. I guess one major time was when my Mom was very sick (she died in 2005). I had gone to visit her and prayed ALL the way home that God would ease her pain and heal her. (I did this ALOT!) That night, I was feeding my little baby girl in her nursery, in the dark. Hubby had already gone to bed. She was sleeping and I was sitting there, rocking her, and praying HARD to the point of tears for my Mom. I was asking God to PLEASE heal her and God gently silenced me and audibly said, “She WILL be healed.” I knew my baby couldn’t talk and hubby was in bed and no one else was around. I knew that was God speaking peace to my heart that night. Little did I know that He meant that she would be healed in Heaven. I believe He knew I couldn’t handle all that that night. That all I needed to know was that God would heal her in HIS way. What a sweet way for God to stoop down to me and calm my broken heart. God is always stooping down to me. When I lost everthing but the clothes on my back nobody but Jesus gave me the comfort not to fear but press on. My family wasn’t sure where we would live but I knew my God would never leave me or forsake me. So I just pressed on. He got me through and blessed me beyond measures. Even now God is stooping down to lift me from unemployment so I’m just pressing on. Thank you Jesus. God really brought me peace and got me through when I was unexpectedly hurried to surgery with a diagnosis of cancer. I am very thankful that I did not have cancer afterall. That is one time when one would really need God to bend to you…how beautiful! Thanks Amy! My beautiful 15 year old granddaughter started having seizures on Dec 10th. we are in the process of adjusting meds and doctor visits but none of this has stopped the seizures as of today. when she has a seizure i feel so helpless because all i can do is keep her from hurting herself. trying to pray during the seizures is “God help her” and i know he has bent down to her and mysekf and also the Holy Spirit has filled in all the words that i could not find to pray. I’m in! God stooped to me 13 years ago when our beautiful twin girls were stillborn…He got us through it! I so want my daughter to understand and cling to God’s word. I pray God will guide her in her choices. Just recently bought your devotional to get her started. thanks, I’m in!! Great Karen! I pray God uses it to give her a desire to dive directly into God’s word on her own! Lynn, I have a very soon to be teen and I would really like the opportunity to begin a bible study with her and her friends. I think it is very improtant in this day and age. I wish something like this had been around when my mom raised me. Count me in!! 2004 My husband had a stroke, the next year, my sister was diagnosed with breast cancer and then my mom was also diagnosed with cancer and a few months to live. God sent me to a new Sunday School class called New Beginnings and the study was Living Above Stress and Worry. I knew as soon as I read it in the church bulletin that God was bending down to me to lift me up. Thank you, LORD Jesus. God has always carried me in my life I am so blessed that he loves this broken girl and is fixing her. Had a very abusive first marriage that I stayed with for 27 years. I never wanted anyother man in my life. God sent me my husband and I am so blessed. This man loves me and is with me. We read the bible and go to church together. There are still days when I do not feel worthly of anything but those days God picks me up and puts me on those shoulders of his and we go on. Thanks for sharing your heart and being real. What a lovely thought that God bends to us! I’m in. I would love to gift this to my 14 year old sister. God has stooped down and picked me up many times. One time in particular, was a couple years ago. My husband was laid off work and then a couple months after that he had to have back surgery. The money coming in was slow going and we honestly didn’t know where the next paycheck was coming from. I was sitting at my desk, crying and praying. When I looked up, I saw a knick in the heater covering which was made out of wood. The shape of the chipped wood was in the shape of a heart. I immediately felt my burden lift and could hear God whispering, “I love you. It will be okay. I haven’t forgotten about you.” God was definitely there and He was telling me He was going to take care of me! Praise God!!!! I’ve never fixed the chip because it is a reminder to me of just how much God loves me and that He’s always there! Thanks for sharing, love it!! I’m in…I’m in need of this today. Needing to turn to God and continue the waiting and trusting. I’m weary from a seeming lack of answers, weary from needing, weary from putting on a determined face for my kids, telling them to keep trusting and not loose faith, that their God is a GREAT BIG GOD and He WILL answer, but my kids, they just kind of look at me, as if this message isn’t enough anymore, when you’re 8 (or 16 or 44) and for 5 years, you’ve heard the same prayers, listened to the same petitions…maybe our questions need to change. We’ve prayed and asked God for direction, to show us ANY other ways. In the mean time, we just hang on and keep going and trust that He’s working in a 1000 different ways than we can know or see right now. He will not leave us or forsake us. He WILL make a way, somehow, away…maybe this will be our revolutionary year! Whatever He chooses, may we just stay faithful!!! I”m in! Thank you so much for your ministry! God uses your words through this blog to encourage me as a mom so many times! God is currently stooping to lift me in the midst of a lot of sadness, uncertainty and fear. Your words were what I needed today. Thank you. You and me both sister! and Lynn, I’m in! I am in! I so enjoy these posts as I try to do things differently with my daughter to have a revolutionary new year! Thanks! I’m in! This really hit hard and home today, thank you for finding areas to need improvements. I’m so glad that I came across this today. I needed to hear what you said. I’m going through a difficult time with my daughter and this lifted me up! I’m in, you described my day too. We love our kids so much and want the best for them… so hard when they choose otherwise. I know God is always present and faithful. I’m in! I purchased a copy of the book recently to check out for my Sunday school girls class and we are so excited to start it! I am SO in! I need some help with my 14 year old daughter. When my husband had back surgery I really felt God come close. Thru the long sleepless hospital nights. Thru my church family stepping up and taking care of our needs. God stoops to lift me so often, and I am grateful. But some of the most special times are when He uses my children to re-focus my eyes on Christ. It is humbling and amazingly beautiful when they are the ones who offer to pray for me in a situation where I’m all a mess, or when they are the ones who gently remind me to lift my eyes up to God, from whence cometh my help! It’s a blessing to see God working in their lives and to be a recipient of that grace. I know God stooped to help me the last few months. My Dad is battling lung cancer ( totally not expected as he isn’t even a smoker) and it hit me so hard I was shaken to my core. If it were not for my faith and my sisters & husband I don’t think I could function. I thank God for every day we have with Dad and today I found you! Thanks Lynn. Grace & Peace to you! I’m in. God has stooped down to touch me in my life many times. I don’t know where I would be without His great love. Your web site is one of them. As I was on the Proverbs 31 website and just read your devotion. I have a granddaughter who is going thru a rough time right now. Low self esteem and some family issues, concerning her parents, and some wrong decisions they have made that affect her life. Your book sounds like it would be a great asset. Thanks for sharing. I’m in! Your blog today was so inspiring and encouraging. I will remember to turn to prayer next time! Two years ago when I lost feeling in my feet and almost couldn’t walk and very little balance. Very scary time, but God definiety swooped down. He restored my health. He is so faithful! God came to me when I wanted to lash out in pure anger and he helped me to show unselfish love instead. Only by his mercy and his grave am I saved! I am in! I feel God stoop to me so many times – His grace is amazing!! But, He carried me through a very hard year this past year with my dad being diagnosed with cancer and going home to be with His Savior in June. I’m in. This devotion was exactly what I needed. Thank you Lord. Psalm 18 “He reached down from heaven and rescued me;” Oh thank God for God!! Thank you Lynn! I’m in! I’m always amazed at how his hand just stoops down and brings us right up to his light and then we can conquer anything when we thought we least could! He is amazing and prayer is just the heart of it all! I’m amazed at what he has done thru our community group and life teachings he has done week to week. I’m amazed at how he just continues to pick up the week at heart and they are able to persevere through it all not matter what! He speaks to us in ways we could have never imagined and oh how great and mighty he is! Currently, trying to do a modified revolutionary love nightly devotional with my almost-13 year old daughter, Rachel. Bought it on my kindle but the devotional book wasn’t sold as a kindle version. Bummed but love the activities we printed out in a calendar format from the website. Would love to win the real books! Thanks for doing what you do! That is so great, Jada! I would love for you to win the “real” books too since the first one acts as a journal of sorts. Thank you for investing in your girl! You are making a difference! To God all the Glory! Struggling each day to overcome fear ever since my father commited suicide it has been hard for me to stay in Gods path without failing Sometimes all I want is to be away from everyone but I have to be strong for my children my youngest is a teen. I been used to give word of knowledge even though I myself need it. I am so happy I found this website. I have 12 y.o. and I am not sure how to address certain concerns so I am looking forward getting the devotional book and other sources. Thanks! God stooped to me when my husband was struggling with addiction almost 9 years ago – he has been clean & sober since and we know we’re good as long as God stays in our center! Just ordered your book and devotional for my 13 year old daughter YESTERDAY! After I ordered it I’m thinking about being more intentional by reading the book and devotional along with her! I sure this is God’s way of telling me, “YES”! I was really struggling yesterday. Had found out another friend had died, making it 8 deaths within 12 months (my dad & maternal grandparents & 5 friends — 2 in 50s from cancer, rest in 80s & 90s). Received a card in the mail from someone never would have expected to hear from (last I heard she was dealing with cancer & know who she is but that is all) offering to be able to just talk, etc. It was a really blessing. In 2008, our son (a NC state highway patrolman) was shot and killed during a traffic shot, he was 24 at the time. I did not think I would be able to go on but I cried out to Jesus for help. He was there to comfort me and help me through the dark hours and now my faith is stronger than ever. Lynn. I am just reading some of your emails. This one couldn’t come at a more perfect time. I am remarried as of 3 years and have 12 yr old boy/ girl twins to my ex husband. My son has been extremely defiant and disobedient etc. Has been telling me for quite awhile that he wants to live w father. Finally this wknd when it was the worst I had him call father and had my son move out. This has been soooo heartbreaking !!! My husband and I are Christians and have kids at church and involved w teens group. I have even had the teens youth pastor meet w them a few times. My son has ADHD and that in itself is a challenge. What has and continues to b a concern is that my ex is still drinking ,possibly still doing drugs. I divorced for those reasons and also Domestic Violence. My son said I’m too strict and too religious. Father is fun and games and NOT a Christian. My daughter is w us and shows no signs of moving. If u have any advice besides prayer, of course, please let me know. We need prayers. I felt Gods love & His help(stooping to lift me up) when I was pushed out of my own home with a 3 year old boy to care for,God sent someone to help me,to take me in & care for me & my son. I didnt have to stay out in the cold but God cared for me & took me in. (as he did in 1994 & saved me) .